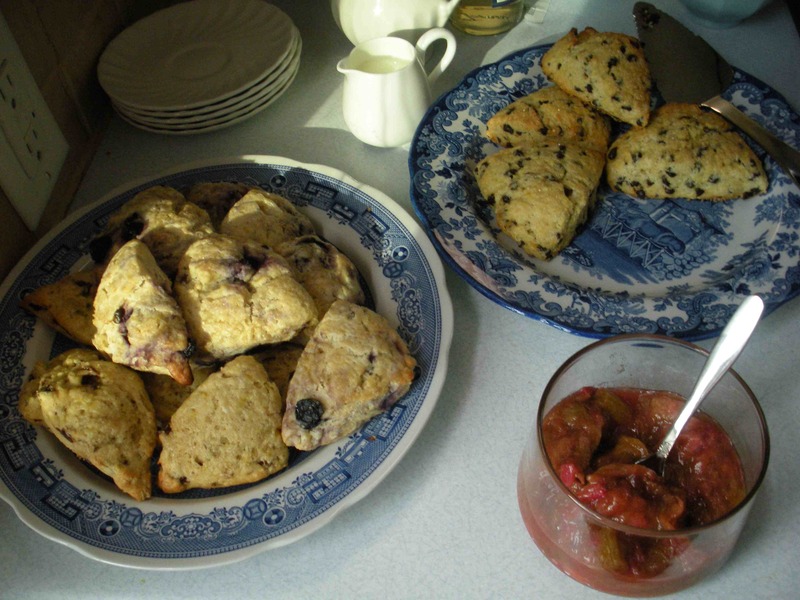 As promised, today was a day of scones. and dried cherry scones, which are some incarnation of another Martha Stewart recipe that I’ve adapted too many times to even recall the original. I was so busy eating the other two kinds—both recipes were new to me—that I didn’t sample this version of the cherry scones, which I adapted again by following some advice from Mark Bittman’s How to Cook Everything Vegetarian and soaking the dried, chopped cherries in a little hot water before mixing them into the scone dough. It looked, at least, like that helped to incorporate them better into the mixture. I really liked the chocolate chip scones, but I rarely turn down anything with chocolate. The lemon zest was really nice in that recipe. The blueberry scones looked terrible when I took them out of the fridge this morning but baked up fine. I used frozen, thawed berries instead of fresh, which may have contributed to the watery/scary situation with the dough this morning, but it all worked out in the end. I’d make them again. The Martha version, of course, has the most butter of the three recipes, but I think that they had the best texture. I avoided any recipe that used heavy cream instead of buttermilk—my heart just wasn’t in it after a week of daily pie-eating (finally made it through the whole thing). All in all, a lovely day of scones and tea, an excuse to use my creamers and my tea cups and to buy sugar cubes. Too bad I don’t have sugar tongs, like my mother. oh. and it’s not just me. see?